Visiting countries abroad, I always love seeing murals by local artists. Then I opened my eyes at home and, guess what, Antwerp has some great artists as well. When you gaze around in Antwerp you can notice lots of graffiti and street art, sometimes just small tags which aren’t always the most beautiful decoration of the streets but if you look carefully you will find some amazing art pieces. These are not always easy to detect if you don’t know the city, but do I have the solution! Tim is a street art hunter who wants to help people discover the hidden beauty in our city, he’s always promoting and revealing new pieces and wants to show it to the universe. You can book a guided tour (also Bike and Vespa tours) for 1.5 / 2 hours and enjoy the enthusiasm of the guide. 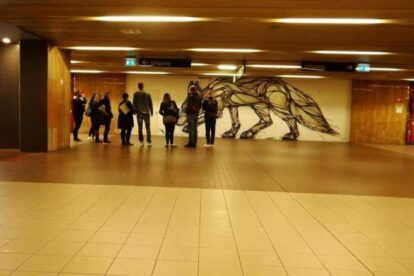 Good news for those who don’t like guided tours; you can download a free Street Art app where passionate street art hunters all over the world document art in every city. You can discover it all on your own!